Longtime Progressive Conservative MPP Elizabeth Witmer is resigning as MPP for Kitchener-Waterloo, leaving the door open to a snap byelection which could shift the balance of power at Queen’s Park. In the October 6, 2011 election, Witmer won the seat with 43.4 per cent of the vote, defeating her Liberal opponent by about 7 per cent. 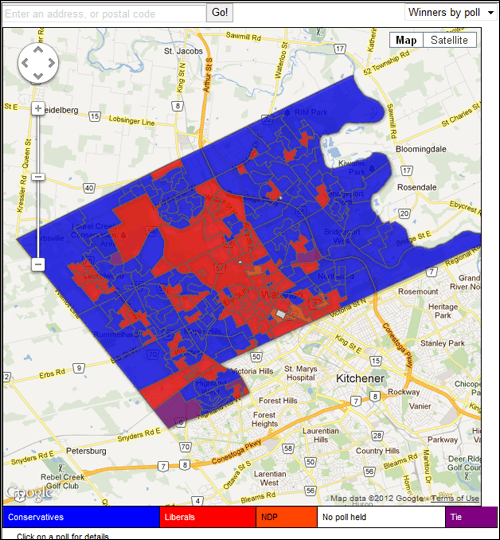 Our map shows the poll-by-poll results for the riding in the 2011 provincial election. Use the dropdown menu to see the PC, NDP, Green or Liberal votes in isolation. In 2011, the PCs took the riding with the suburban outskirts of Waterloo, while the Liberals held a solid block of polls in the city centre. The NDP won in a few polls in the south of the riding. Click on the image to see the full interactive.